Your natural watering hole when you visit the brewery (or brewery store), and the samples of the brewery tour are not enough. Fuller’s cask ales in perfect nick, as expected. Edible food. Maybe not worth a detour, but compulsory when you are in the neighbourhood. It is inexcusable to provide a friendly pub such as this as your brewery tap and supply it with such a substandard range of low quality beer. During a previous visit five years ago almost the entire Fullers range was available on draught along with a well stocked fridge containing all the rest. The beer was excellent. On my last visit there were four badly kept ales on. My Chiswick bitter was little more than dirty water. No wonder that the largest group of drinkers in the pub were all drinking lager. In 2015, with a London beer revolution showing no signs of slowing down, such complacency is disgraceful. This place is the Brewery Tap for Fullers. London pride, ESB, Seafarers, Chiswick Bitter, Honey Dew and seasonal beers are the Beers, And Fuller's 1st larger, Frontier is also available as well as veltins pilsner. My mate & I visited yesterday, & had a really-good couple of pints in an excellent, convivial atmosphere! Apparently, the pub is normally closed at the weekends, but we were lucky as there was a brewery tour group meeting beforehand. Thanks very much for an enjoyable time- & I hope to find it open next time I'm in Chiswick! Inevitably I paid a visit (actually two) to what is the flagship pub of Fuller, Smith and Turner's 365 in total, as part and parcel of a very comprehensive and engrossing tour round the Griffin Brewery and its historically-rich environs. Happily, the entire experience was free-of-charge thanks to a colleague of mine winning a tour and lunch on a James May-endorsed Facebook competition - social network sites finally show themselves to have a worthwhile use after all! It meant that myself and another lucky co-worker were treated to the full-on Fuller's experience. The tour may not be a freebie for all, but even at the �10 pricetag, it comes highly-recommended, especially to those who might have considerable experience of micro-brewery visits but perhaps less of the regionals. It forms a fascinating counterpoint. This excursion is run personally by John Keeling, the head brewer and Fuller's-based since 1981, who has a well-rehearsed and rich awareness of the company's history as well as experience of breweing their beers, and the wider social and architectural background pertaining to Chiswick Village - the rather quaint and immaculately-preserved island of Georgian buildings sandwiched between the Thames and the modern, hectic A4 carriageway. It is a veritable oasis of civility and calm despite still being centred on the hive of industry that is the brewery, and Keeling's tour takes in the surroundings, where the barges used to stop off on the river, ex-brewer's houses, ex-pubs (there used to be 5 on 'the island' plus 1 brothel!) and the beautiful church where W Hogarth among other prominent personalities are buried. Fortunately for me and others who don't always find appeal in the raw scientific detail of brewery tours, John's focused less on that and stuck to the core details with flourishes of history added in to keep the dialogue between the old and new Fuller's operations going. He is open to questions and comments and is more than a good host, especially when it comes to sampling in the Hop Cellar at the end. The usual range of 5 or 6 cask beers are made available along with a wide selection of their bottled offerings (conditioned anf filtered). We were moved along to the pub at 2PM for what proved to be a hearty luncheon - being the glutton I am I opted for the two courses (tomato and watercress soup then steak and ESB ale pie 'n' chips) which were both found in excellent form; really tasty as I'm sure the other options were. Indeed, given Fuller's rather lofty pricing strategy in their pub estate it tasted all the sweeter taking some grub off them for nothing! The menu was that of a smart pub but not gastro-ish; pub grub meets bistro which suits the ambience of the smartly-decorated yet traditionally-themed interior of the Mawson. Ale-wise, one has a selection of I think 5 on cask and the usual bottled fare. The London Porter, Pride, Chiswick and current seasonal Front Row were all splendidly-kept as one would expect, and lingered long on the palate after swallowing. At this point I should say the welcome from the barmaids and manageress was convivial, and service efficient and pleasant. We really were treated well despite not having paid a penny for it. 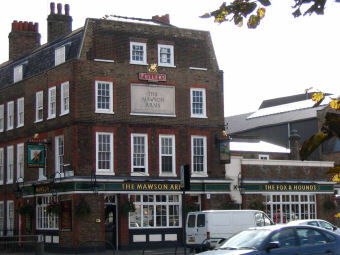 Before you wonder too hard, the pub has two names as it's believed that the Fox & Hounds stood further down where the brewery shop now is - as it was an equally-prominent meeting place, when it closed it was decided that the name should be moved to join its neighbour the Mawson on the corner, which was a 2-bar arrangement then. The dual name has stuck ever since. Even if I was a paying customer I'd have been pleased to part with the necessary funds to obtain the quality of the wares and service at this pub, and it is a worthy talisman for the best aspects of the modern Fuller's operation. Yes, it does follow the usual Fuller's template and in some parts of London one is perhaps beset by similar pubs belonging to this estate. But if you're not near one, or perhaps feel you've fallen out of love a little with the ubiquity of the company's beers, travelling out here may hold greater appeal and act as a reminder of how good it can be, whether or not you're in the market for the full brewery tour.